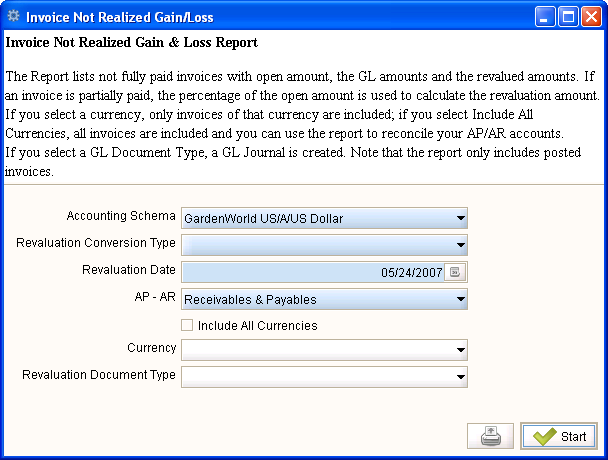 Help : The Report lists not fully paid invoices with open amount, the GL amounts and the revalued amounts. If an invoice is partially paid, the percentage of the open amount is used to calculate the revaluation amount. If you select a currency, only invoices of that currency are included; if you select Include All Currencies, all invoices are included and you can use the report to reconcile your AP/AR accounts. If you select a GL Document Type, a GL Journal is created. Note that the report only includes posted invoices. The purpose of this report is mainly to allow the revaluation of foreign currency items in a companies AR and AP ledgers at the end of a financial period. If transactions of all currencies are included then logically all invoices and allocated payments are included therefore the total should equal the balance in the GL account. The report should produce two columns " this is value presently in the accounts" and "this is value that should be in the accounts if all the open trx in foreign currency were revalued to the exchange in the system on the date selected in the report parameters". Another use of this report can be that if you have (say) multiple accounts receivable general ledger accounts then the open items report will not break up the the transactions by GL account code. This report does so it should provide a means to demonstrate that the open items agree with multiple AR control account balances. This page was last modified on 28 June 2009, at 19:04.